Los Angeles readers might be shivering in their Uggs as they're reading this (In SoCal, anything below 70 is cold and anything below 50 is freezing! ), but Spring has already sprung at Smashbox Studio. 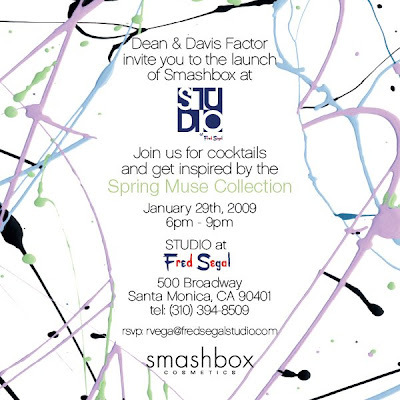 So head over to Fred Segal in Santa Monica tomorrow evening and check out Dean and Davis Factor's Spring Muse collection. Ugly Betty, Grey's Anatomy, The Office and 30 Rock are all RE-RUNS this Thursday night--so check out Studio at Fred Segal instead!